In addition to the main trunk line running the length of the South Island, branch railways were important in Canterbury. They carried passengers and goods between rural districts and Christchurch. 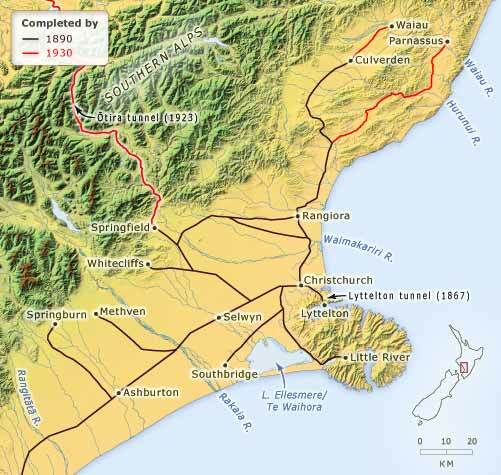 This map shows Canterbury’s rail network, and how it developed to 1890 and then to 1930. The rate of development in the 1870s and 1880s was particularly marked. After that it slowed. It was not until 1923, for example, that the railway reached the West Coast, providing a vital link across the Southern Alps.